Dr. John Vartanian, a top Glendale facial plastic surgeon, can discuss various options with you that can be used to improve the unattractive neck. Computer imaging can be utilized to demonstrate the likely effects of some proposed surgical improvements. Advanced computer imaging used by our facial plastic surgeon can also be used to determine the approximate amount of change in neck or chin contour that may be desirable. Loose skin, muscle, and accumulated fat under the chin can lead to an unattractive appearance. Due to the natural aging process, recent weight loss, excessive sun exposure, genetics, or other factors, the skin of the neck can lose elasticity and give one what’s known as a “turkey-neck” appearance. 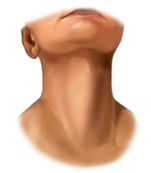 Relaxation of neck muscles can result in vertical bands running from the chin to the base of the neck. Neck fat also tends to descend and “pooch out” with age. The fat under the chin is often hereditary and much less affected by dieting, fitness regimes, or weight loss. In certain cases, younger patients can benefit from enhancement of the neck. Careful micro-liposuction can be used to improve the jaw line, neck, and under the chin. Older individuals who have undesirable excess fat and flaccid neck muscles may require a neck lift or a facelift. Neck enhancement can also sometimes benefit from chin augmentation. Some of these procedures can be performed under local anesthesia (without being put to sleep) in our office. Various degrees of neck problems can be improved. Dr. Vartanian’s necklift is a minimally-invasive procedure that can often be performed with minimal downtime and without the need for anesthesia. Dr. Vartanian can discuss various options that can be used to improve the unattractive neck. For more information on neck lift treatment, or to schedule a consultation, please contact Dr. Vartanian today. Neck lift surgery is one of the most effective cosmetic treatments available to improve a sagging or drooping of skin along the neck. A neck lift addresses one of the most common aesthetic issues we face: an excess of loose, inelastic skin in the neck. The results can ultimately give your neck a more youthful appearance that can ultimately have a positive effect on your entire facial aesthetic. Dr. Vartanian’s neck lift technique is a minimally-invasive procedure that can often be performed with minimal downtime and without the need for anesthesia, depending on whether you are undergoing neck lift surgery in combination with another procedure. During a neck lift, Dr. Vartanian will carefully remove excess skin and tighten the underlying muscles, then pull the remaining skin taut for a firmer and smoother appearance. The incisions for neck lift surgery are usually created under the chin and behind the ears, so any residual scarring should be virtually unnoticeable. Neck lift can be (and is often) combined with facelift surgery and/or neck liposuction for the ultimate rejuvenation. For patients who have neck lift surgery alone, you can typically expect to return to normal daily routines within one week. Some temporary bruising and swelling will be evident in the neck area after surgery; however, any discomfort can be managed with medication. Patients having minimal neck procedures or liposuction may return to work the next day. Dr. Vartanian will advise you to avoid excessive mobility in the neck or activities which may strain the neck for several weeks in order to ensure proper healing. Length of Time for Procedure? The exact length of time for a neck lift can last as little as one hour, but can be more depending on the type of procedure needed and whether it is combined with other procedures, such as a facelift. Who Performs this Procedure? Dr. Vartanian performs all neck lift procedures himself from start to finish. What about Recovery? Some downtime is necessary after a neck lift and can last several days. Most patients are typically able to resume normal daily activities within one week. What about the Results? Results are immediately apparent; however, the best effects occur after the area has completely healed. The smoother and firmer skin provided by a neck lift can ultimately result in a more youthful appearance. For more information on neck lift surgery, or to schedule a consultation with our facial plastic surgeon, please contact Dr. Vartanian today.